Some four years back living the fresh graduate dream of working as a banker I would probably agree with you that I was in a tasking profession and that finding time to do anything on this job was a miracle and as such Friday nights and weekends were heaven. But two months back, July 14th 2012 to be precise I would probably tell you that working in sales in FMCG was second only to sitting in GEJ’s hot seat as commander in chief. I was up late into the night, continuing early the next morning finishing a report whose submission deadline had just expired. I slept at Ade’s for company and to take advantage of his stand by generator. The next morning Sunday the 15th I loaded up my MP3 player with songs to help me get by the long journey, dashed home to get some gear and hit the road for a 5 hour trip (to and fro though). The company was about to launch the redesigned Star bottle and we had to redistribute the old Star stocked in a warehouse in a neighbouring town to ensure quick depletion before the planned new launch. With my boss and 2 colleagues of mine we were to drive in a convoy, but sensing they weren’t yet ready I passed by our meet up spot and hit the road early so I could make it back by midday to do other stuff. And that was all I remembered. Word was that 45 minutes into my journey I had a head on collision with an empty fuel tanker. Being the careful driver I’ve always been I’m still stunned as to how that ever happened. The good or great thing though is that like Elnathan advised the lines fell unto me in pleasant places. After I left Boss and my colleagues followed me up shortly. At my accident scene the typical Naija crowd was forming with shouts of “mo gbe” and all what not but no one really doing anything. Boss soon caught up with me, dialed his hospital contacts prepping them for my arrival, lifted me up into his passenger seat with me clutching my broken wrist and sped the 45 minutes or so journey back to Ilorin. Two months later, many plates of food from Boss wife after, and visits, love and care from family and friends I’m sitting at home. Luckily having to contend only with a fracture at the left wrist and right femur, and six nerve palsy in my left eye. How I survived it all I don’t know, I’m God’s son. But working for a great company, generous enough to put me on 4 months sick leave, expend on me and transport me to Lagos for a checkup is definitely a saving grace. To top it all up like Lisa’s Dad exclaimed in “Coming to America” I really did do it this time; I hit the jackpot. I couldn’t have come thus far without my girlfriend AyoB catering to me all the way. Always knew she was the complete package right from the start but if I ever did need any confirmation I’ve gotten it. My Chukwuemeka Ike Toads for Supper inter-tribal dreams are coming true. And so now you know the answer to the question "who do I want to spend the rest of my life with". Trae_z great intro to a great existential post. We thank God you made it out and still around to write about it. There's a book in you somewhere. 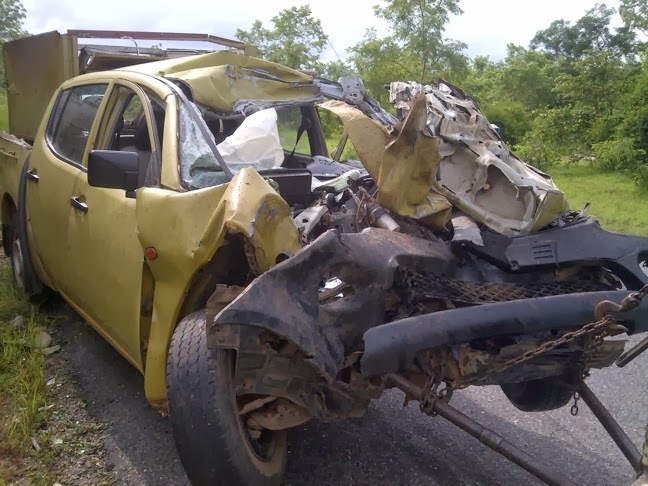 My cousin in Abuja also suffered a similar fate while she was driven to work one morning, driver instantly killed, she still wondering why she's here today. @Obi: Sorry about your cousin, i already follow you on Twitter! You're my mentor now! Thanks. Hmm. My brother it is not very easy oo. One can try to avoid road accident. But it is very difficult to survive it oo. Nevertheless this article has really benefited me a lot.